Individuals who have earned a Human Resources Compliance certificate will understand the legal requirements and regulations within the labor environment. Earners have demonstrated the ability to analyze, assess, and prioritize areas of risk; communicate the importance of compliance to internal stakeholders, and create a compliance plan. Course 1: Human Resources Compliance and Risk Management. 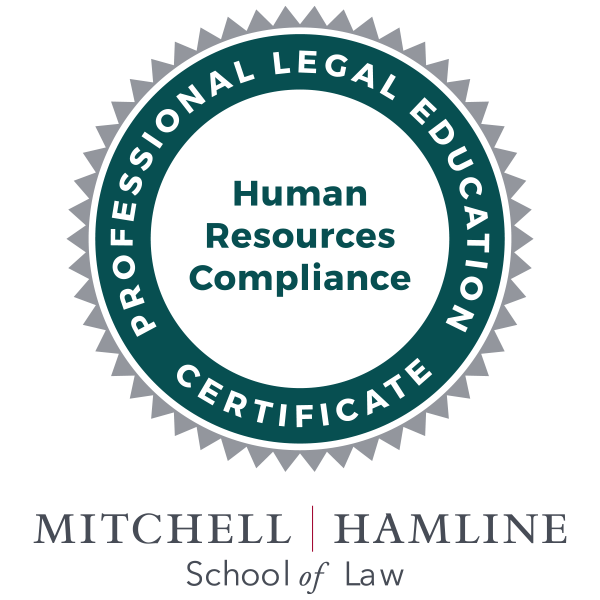 This course provides an introduction to the employment law, compliance, and risk-management issues that human resources professionals must be familiar with. Course 2: Talent Acquisition and Pre-Employment Compliance. This course examines compliance issues related to recruitment, hiring, and training. Course 3: Compliance During Employment: Development, Administration, and Enforcement of Policies and Procedures. This course covers compliance topics that pertain to the establishment, management, and enforcement of organizational polices, including social media, performance evaluations, investigations, and discipline. Course 4: Compliance Issues in Ending Employment. This course covers the end of the human resources life cycle by examining the areas of risk involved in termination, layoffs/workforce reduction, and retirement.